A tribute to the first man in space recently unveiled in the Serbian capital Belgrade has caused dismay because of its seemingly ridiculous proportions, it's been reported. But its appearance - a tiny bust on top of a tall plinth - has been met by a hugely negative reaction, the paper says. "The only way you can see it clearly is to launch yourself into the sky," the Noizz website says. "While this is somewhat symbolic," adds writer Ivana Stojanov, "there's certainly no common sense on show". One of the first to notice something wasn't quite right was the Belgrade-based @Cenzura Twitter account, which posted a photo along with the simple caption "Oh no". The reaction on social media has been predictably humorous, news website Telegraf reports, with one Twitter user suggesting that the sculpture was designed that way to beat the elements: "Belgrade is windy. Probably so it wouldn't blow him away!" Another thought the designers were worried about local crime: "I think the reasons were practical, to stop someone from stealing it". Meanwhile, a third thought the rest of the statue was simply concealed within the enormous plinth: "It looks like they packed it inside that monument, so it's just his head", while another suggested it was a conceptual art piece where you have to discover the rest of his body yourself. 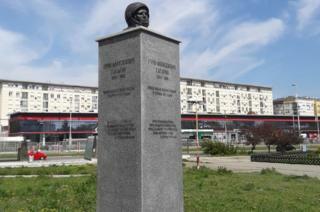 But there are many who consider it an unfitting tribute to the Soviet hero who orbited the Earth on 12 April 1961. Compared to monuments to the first space traveller in Moscow, "the one in Belgrade today is a scandal and an insult," Belgrade-based Danilo Curcic tweeted.